If you want to see ENGLISH, click here. Join the Program and Support Japanese Sake and Rice Farmers in Kyushu! Support this Program for a Japanese Local Sake Brewery with Rewards! Ikekame Shuzo was opened as Sake brewery 130 years ago in 1875 by Genzo who was the master swordsman in Kurume Domain. He set the brewery near Chikugo River whose water inspired an innovative brewing style in Chikugo Area and he received the Green Ribbon Medal. We have succeeded the innovative spirit while maintaining the tradition which earned various awards in sake brewery industry. However, under the long term of the severe situation as the market demand for sake rapidly went down and rice farmers have few young successors, we have been facing the real crisis.Kyushu area, which used to be know as one of the top 3 sake production, is particularly in desperate for young farmers because it is attached to the factories and IT industrial areas. Sake requires specific type of rice which has been damaged by global warming. With your support, our new sake project should work to attract young people to rice farms. We are in crisis and we stood up with an innovative idea. Japanese Sake for Italian and French, to cultivate a new market in the world. “黒兜　Kuro-Kabuto” or black helmet is the new type of Japanese sake brewed by koji-mold which is usually used for shochu (Japanese distilled spirit). Koji-mold makes Kuro-Kabuto unique with fresh and citrus kind of taste, unlike other typical Japanese sake which is rather thick and sweet, to go well with Italian and French cuisine not only Japanese. “...because I believe the success should attract more young people to the rice farming so our traditional industry can survive”. Teruyuki Kamachi, Ikekame Shuzo Co., Ltd.
Our goal is JPY600,000 and if we could not gain enough supports, all payment will be refunded to you. If it reaches the goal, the promised “rewards” will be sent to you according to how much you donate. Your fund will be used to operate this support program solely. This crowdfunding system is operated by Tokyo Calendar, food magazine publisher. We sincerely wish you will join this support program. This program is hosted by Egoista who was founded in May 2013 as a Japanese sake consultant in Aoyama, Tokyo. “Ikekame Shuzo Support Funding” is one of our first support programs. 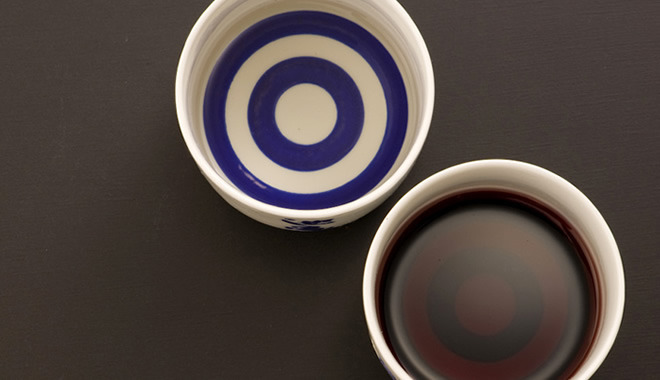 We fell in love with the taste of their sake which was brewed with black-koji-mold. It goes well not only Japanese or oriental foods but so well with Italian and French. 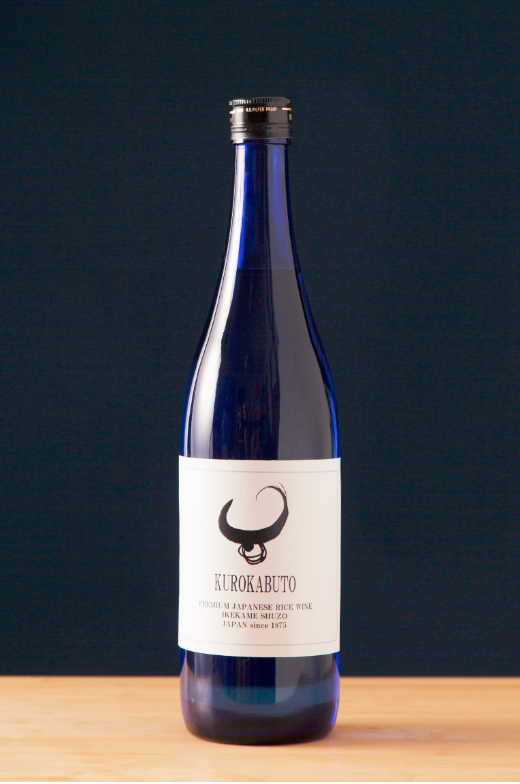 Our project will start with bottling it in the Western design bottles to promote this fabulous sake to the world as the production has been available only in the local area. To appeal to Western restaurants and wider market, we need to change their concept of Sake so they can experiment fresh and citrus new sake taste without prejudice. To promote the new design, we prepared a vote. There will be several wine-like labels and the supporters will vote for one. To show how this sake goes well with various dishes, we provide a tasting party in Tokyo. 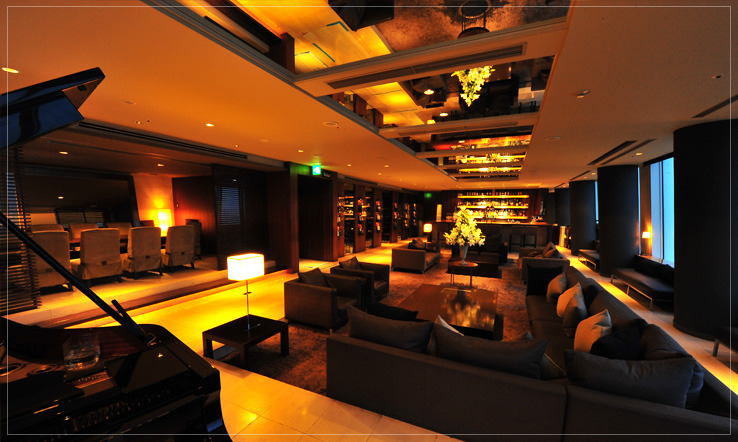 Thanks to Wise Table (Co.Ltd) , the party is now to be held at XEX Atago Green Hills, where the finest dining can be enjoyed at their Japanese restaurant, Italian ristorante, or the Bar. Genzo, who was a swordmaster in Kurume Domain, found a new way to brew sake with water from Chikugo River. He founded Ikekame Shuzo in 1875 near the river and sent out trained chief brewers to other breweries in the domain to make the special sake the local specialty. The innovative manner has been succeeded by the sons and the grandsons while maintaining the good traditions. The current owner, Mr. Kamachi, used work for alcoholic beverages manufacturers in Japan involved with wine, shochu (Japanese distilled spirits) and Japanese sake before succeeding Ikekame Shuzo in 2006. His experience with various kinds of drinks trained him for acidity which lead him to a new brewing style. Usually, Japanese sake gets acidity from lactobacilli produced from fermentation. Mr. Kamachi thought of using “black-koji-mold” which is used for a kind of Shochu and produces fruit acid. The use of the mold gives Japanese sake mild “ginjo*” aroma and clear taste. Without being gaudy, the presence remain freshly. Palatable acidity will surround your tongue but it is dry enough so it does not remain tediously on the palate. 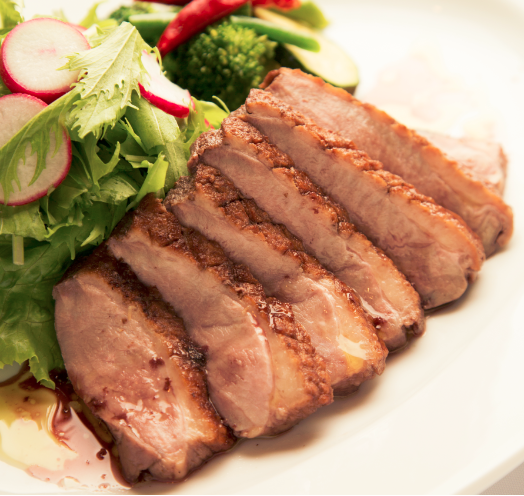 It will surprise you by giving beautiful marriage with roasted duck or any dishes with olive oil such as white fish Carpaccio. “Black koji-mold” is cultivated by our brewery to keep freshness for better fermentation. 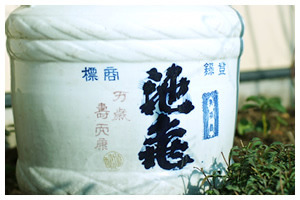 Few sake breweries use “black-koji-mold”. 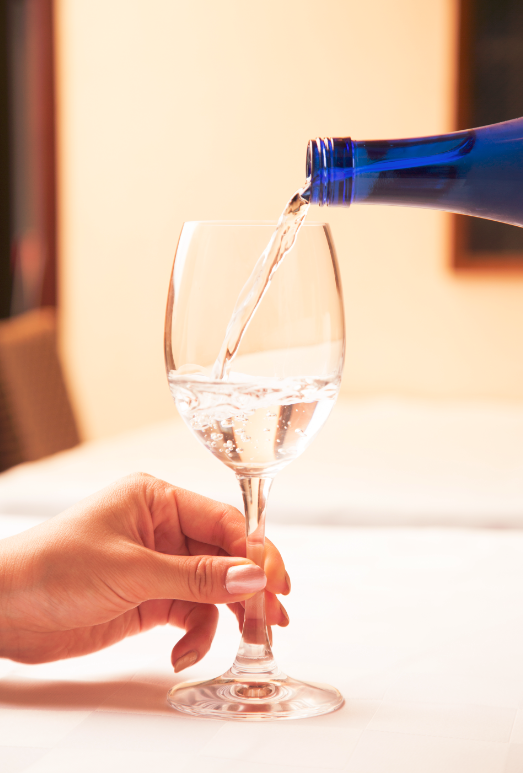 In Japan, more people enjoy Japanese sake by wine glass because the wine glasses are designed to produce more aroma and atmosphere. Japanese traditional cups for sake are still good but no need to be limited to so you will have a choice according to your dishes and plates design. Japanese sake typically tastes sweet and sticky which could be too heavy for meat or oily dishes. 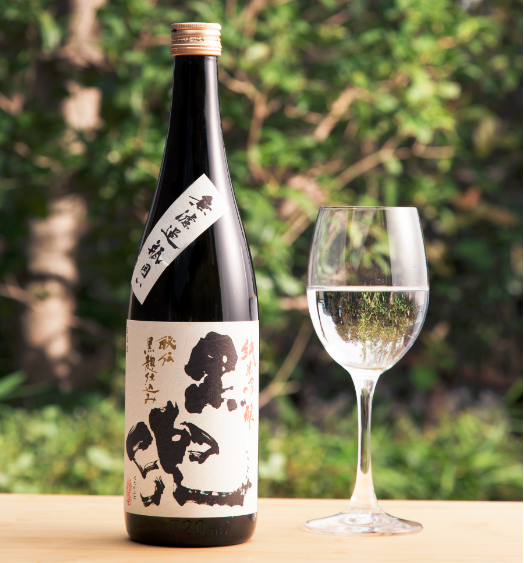 The sake brewed by “black-koji-mold” whose taste reminds you of Riesling with fruity and clear aroma gives you a joy to enjoy with French and Italian dishes. Tokutei Meishoshu or special designation sake Sake is known as premium sake. They are classified by their ingredients, brewing methods and condition. All the tokutei meishoshu have to use special rice (higher than grade 3), specified polished rice ratio, specified koji-mold ratio (more than 15% of the total amount of polished rice), grade of aroma. Distilled alcohol can be used in Ginjo-shu and Honjozo-shu but has to be less than 10%. Please understand that shipment of sake is only limited to Japan due to the customs and importexport license issues. ・Two bottles of “Kuro-Kabuto in the specially designed bottle. Total Two bottles: One bottle is special premium sake“Daigingyo Ikekame”, and another bottle of your selection at the party from our premium sake. 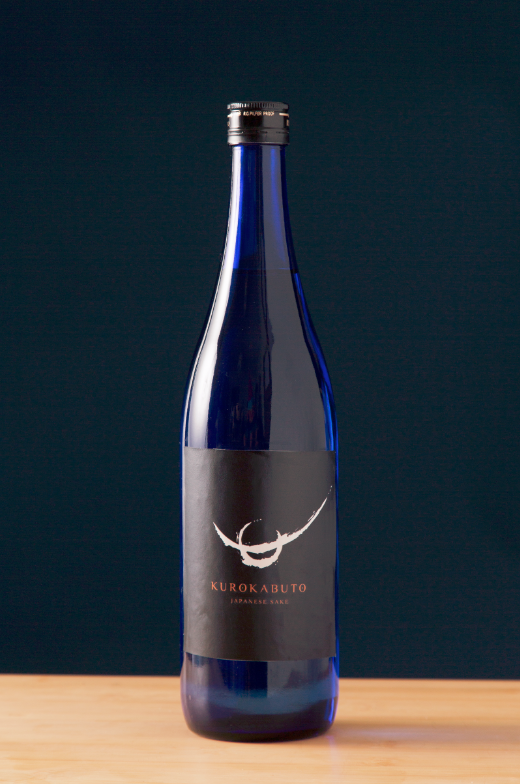 ・A bottle (750ml) of “Kuro-Kabuto in the specially designed bottle. ・Limited only to the supporters of this programme. ・The chefs and sommeliers of Wise Table will produce a special dinner for the sake. A full course buffet along with live jazz music. ・Sake tasting with various sake from Ikekame Shuzo. A talk by the representative of Ikekame, Mr. Kamachi. We are sorry but due to the customs and import/export-license issues we are not able to despatch Japanese sake outside of Japan. Your donation will be appreciated and we will be pleased to send you donation certification and invitation tickets. It is also possible to reserve your sake till you visit Japan. The payment through this site is limited to the holders of credit card issued in Japan. As the description is in Japanese please refer this site with translation as a guide. Please contact us from here. Your comments and suggestion would be appreciated to improve our future programs.Thank you for your kind interest in Japanese sake!